Nut butter machines have become a staple in natural food stores, but that’s not the only place they are popping up and creating delicious creamy nut butter and spreads. Nut butter mills are found in grocery stores, delis, bulk food stores, and farmer’s markets. They are even found in cafés, coffee shops, ice cream shops, and fitness centers where customers and clientele prefer natural food with natural ingredients. And that’s just what these machines provide. Perfectly suited to specialty food stores, nut butter makers provide an eye catching centerpiece in your bulk food section, creating a fun self-serve dynamic that draws consumers in, then brings them back for more—as well as encouraging them to tell their friends. Pleasant Hill Grain is the exclusive exporter of Olde Tyme nut butter makers. 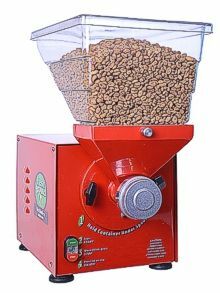 Keep reading to learn about buying a nut grinder for your store, or browse our selection online. Tastes better – you control the nuts that go in so you have control over the pure taste of the nut butter. And fresh tastes so much better! Is healthier – there’s less fat, trans-fat, and sugar compared to store-bought spreads. Has no unwanted preservatives or additives – since you make it when you want it, it doesn’t need additional chemicals to ensure a longer shelf life before it’s bought. Is completely customizable – you control the nuts that go into your spread. See below for the wide range of nuts that these grinders can process! When you’re choosing the nuts to grind it’s best to grind dry roasted and unbleached nuts that are diced or chopped. Olde Tyme nut grinders are a staple in the natural food industry and have enabled retailers to provide freshly ground nut butters direct to consumers in stores across the country. At Pleasant Hill Grain, we sell the Olde Tyme Nut Grinder and the Olde Tyme Nut Grinder 50HZ, both available in stainless steel and the classic red cabinet. All models are NSF-certified. Storage – Olde Tyme nut grinders are compact and need very little shelf space. If processing for yourself or allowing customers to self-grind, you’ll want to have room available for jars, nuts, and labels. Electricity use – Our nut grinders run on 1-phase power, so 3-phase power is not required. Power supply – Models are available for: 10V/60Hz (20 amp), 220V/60Hz (10 amp), and 220V/50Hz (10 amp). Efficiency – You’ll want to consider how much nut butter is produced per minute. Bins hold about 20 lbs. of nuts and produce 2.5 lbs. of nut butter per minute! Timer settings – Speaking of efficiency, commercial nut grinders have an internal timer that can be adjusted to run from 1 second to 17 minutes, or disabled. When the nut grinders are shipped the timer is set to 24 seconds, which produces about 1 lb. of nut butter. Purchasing multiple grinders – Multiple grinders allow you to offer several types of freshly-ground nut spread in your store or café with no reloading or product mixing. Self-cooling features for the motor – Olde Tyme nut grinders are equipped with totally enclosed, fan-cooled motors. They have a 100% duty cycle, so they can be operated continuously for hours. Ease of cleaning and maintenance – All parts that come in contact with ground nuts disassemble in moments without tools for quick, easy cleaning. Olde Tyme nut grinders will instantly become an eye-catching centerpiece in your aisle or on your counter. Models are available in sharp stainless steel or statement-red cabinet. We also have nut butter labels available for these machines—displaying your peanut butter grinder, cashew butter grinder, almond butter maker or organic peanut butter maker. These labels provide customers with the easily read Nutrition Facts and a reminder that fresh-ground nut butter is all natural and contains no additives, preservatives, or cholesterol! For home and business owners alike, Pleasant Hill Grain provides a superior online shopping experience for home, kitchen, and outdoor products, including our selection of commercial nut grinders/nut butter makers. We offer free shipping on orders over $59 (so our nut grinders ship free!) and also phone support from our friendly, experienced customer service staff. Have questions? Please call us at the number below—we’d love to help you select a product that’s perfect for your needs!